At the start of 2019, many businesses we engage with are focused on launching recycling programs or improving what is already in place. Whatever the reason for wanting to recycle more, creating a successful recycling program can be challenging without some help. RoadRunner to the rescue! In this post we detail six important factors to consider while creating, or improving, a recycling program at your business; to get employee buy-in and maximize your recycling rates. The right containers for the job will vary depending on your business. In order to maximize your recycling rate, we recommend a ‘clean stream’ approach, where multiple ‘bins’ are used to collect different recyclable materials – paper, cardboard, commingled (plastic, metal, glass) - and landfill (for anything your business can’t recycle). You might be asking yourself, “how would this be set up inside a workplace?”. 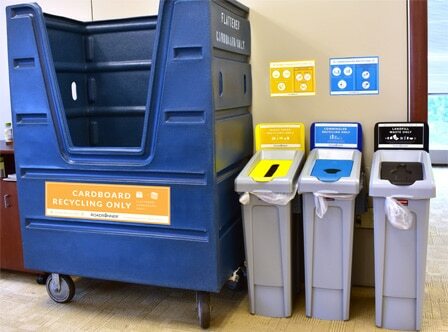 We recommend replacing desk-side bins with centralized collection points around your workplace. Instead of your employees tossing everything into a garbage can at their desk, they are required to get up and think about what they are throwing away. Clean Stream recycling is the best approach if you’re interested in recycling more, reducing material contamination, and retaining the value of your recyclables. Have you ever found yourself throwing something into a recycling bin without knowing if it’s actually recyclable? It’s okay, understanding what materials you should recycle can be confusing. To help make it easier, include labels at each collection point that clearly state the acceptable materials for each bin. This goes a long way in ensuring recyclables wind up in the right container. - Nominate one or more Eco-Ambassador(s) to execute, promote, and enhance your recycling initiatives. - Coupled with educational signage, informational documents like flyers and stickers at each disposal point are useful for raising awareness and reducing confusion. 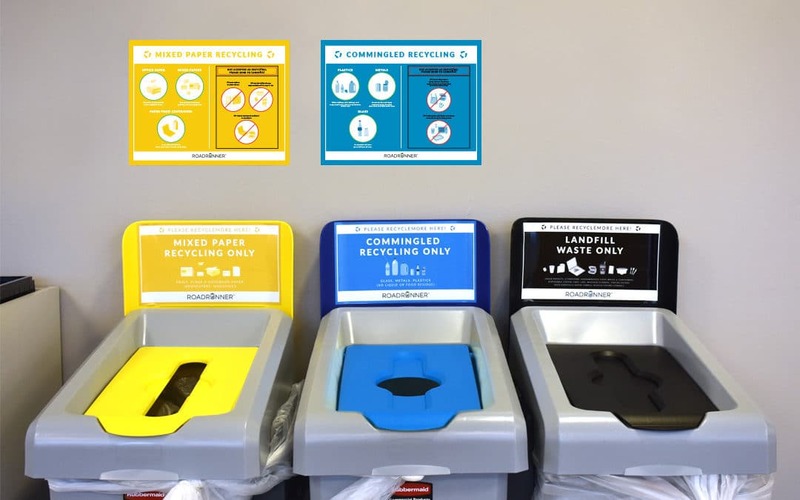 - Color-code collection bins and signage, by recycling stream, across all points of the facility to eliminate confusion and increase waste diversion. Whether you are introducing a recycling program or improving upon what is in place now, it’s important to spread the word and ensure everyone is aware of your business’ recycling goals. This includes cleaning staff, tenants, employees, and anyone using the bins each day. Consider tasking your Eco-Ambassador(s) with sharing program updates, via staff memos, that include any relevant information they should know about. These communications can address a variety of information, from the announcement of the new recycling program, to reporting instances of contamination, to highlighting program progress after it launches. Tracking the progress of your recycling program will help you report on how the initiative is impacting your business’ recycling goals. 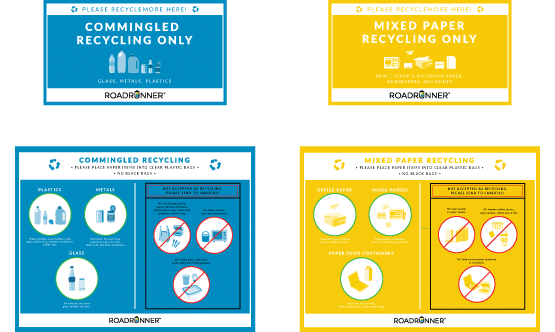 If your business is launching a new recycling program, take some time to understand your ‘benchmark’ recycling rate for each material so you can track your progress in comparison to that. Tracking these metrics will also help you identify problem areas and shed light on where improvements are needed. Your findings may tell you additional signage is needed to reduce confusion, or that you need to update your pick-up frequency. In the end, the information you gather will help you adapt your program to continue improving your business’ recycling efforts. Based on your analysis, it is important to set goals for your recycling program. They will help you identify what you need to do continue increasing recycling rates. Share your goals and progress with your staff to motivate them to keep recycling! Leave us a comment below and let us know your recycling goals and what has helped your office improve recycling rates! Interested in recycling more? As part of our service we will manage your waste and recycling operations and implement strategies to help your business meet its goals. Contact us today to learn more.